Floor Woods has been serving the Lowcountry for over 30 years. Trust your #1 hard wood flooring specialists – Call Today. With decades of hard wood flooring experience, our expertise stands above all of our competition. Our quality and craftsmanship is unrivaled in the Low Country. Floor Woods Hardwood Floors is the Lowcountry's leader in hardwood floor refinishing, installation, and wood floor restoration. Our family owned business has made a name for itself with by providing quality workmanship and excellent customer satisfaction. Customer satisfaction is important to us. Whether we're installing new hardwood flooring or repairing your existing floors, we always guarantee your complete satisfaction. Hardwood flooring costs shouldn't be prohibitive. We can provide you with a complementary estimate so you can see how affordable hardwood flooring can be. Floor Woods Hardwood Floors has been serving the Lowcountry’s Hardwood flooring needs for over 30 years. We continue to be the leading flooring service provider in South Carolina. Floor Woods Hardwood Floors holds onto the tradition of family and apprenticeship. Craftsmanship is an accumulation of wisdom and skill that must be passed down. Enjoy the convenience and flexibility of online payments through Paypal which allows multiple payment methods including e-check, credit card, or even bank account drafts. While other flooring companies require you to visit a showroom, we pride ourselves with the ability to go to the customer with the product selection process. 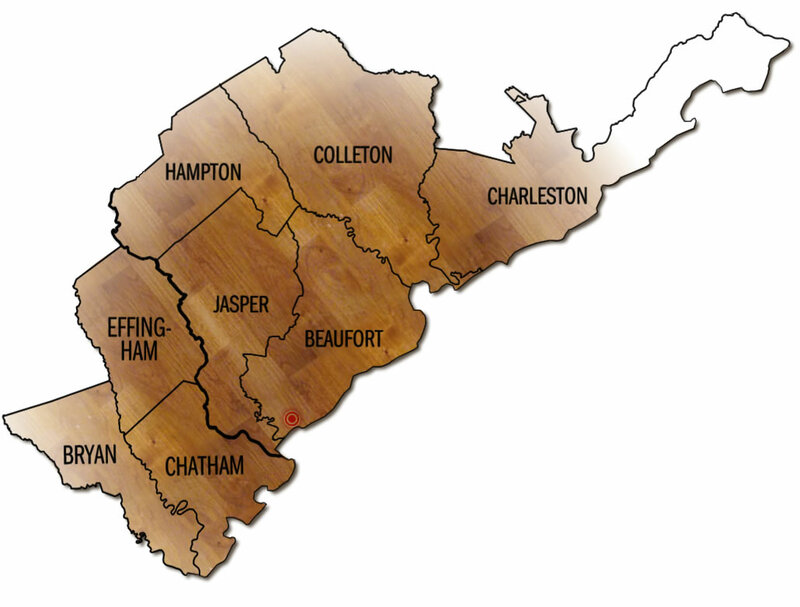 Providing Hardwood Floor Services in South Carolina & Georgia - Hilton Head, Bluffton, Beaufort, Savannah, Charleston, Jasper, Colleton, & Chatham County. Whether we're installing a new hardwood floor or restoring the beauty of an existing wood floor, our commitment to excellence and quality comes first. We lead the industry in customer satisfaction by providing the highest quality service possible. Words cannot convey how impressed I am with Floor Woods! My existing oak flooring was so worn I thought it had to be replaced. Floor Woods said they could refurbish the floors without having to replace them. WOW - my floors now look amazing and they saved me a ton of money. Thank you Floor Woods! I have to say that I was impressed with every aspect of this company. Fine craftsmanship, service, and price! "A true pleasure to do business with. Exquisite service and under budget too. Floor Woods is the best flooring company you will ever find!" "Absolutely the most beautiful floors I've ever seen. Imaculate! Excellent service and a pleasure to do business with. Highly recommended!" Floor Woods Hardwood Floors has been serving the Lowcountry’s Hardwood flooring needs for over 30 years. Founded with the belief that a beautiful floor is the product of fine workmanship, Floor Woods Hardwood Floors continues to be the leading hardwood flooring service provider in coastal South Carolina and eastern Georgia.